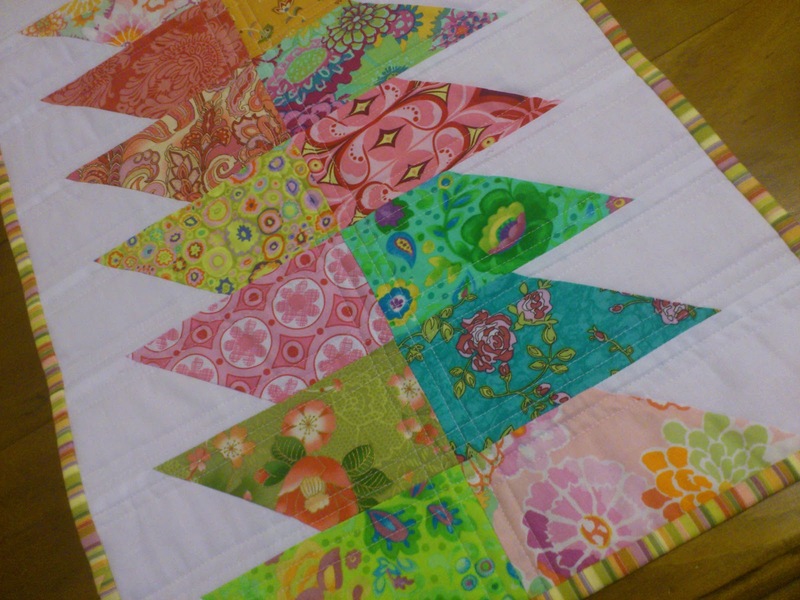 and makes quilting so much easier.. not fiddly cutting. I have used 26 colored chisels and 26 white background chisels. was made in about 2 hours all up including quilting and binding. I straight lined quilted it... so simple yet so effective. especially when using Kaffe Fasset fabrics. I find that really really really hard cos I like matching...Do You? you can get 22 Free patterns if you sign up for them Here. I love your table runner! 2 hours!!! Amazing! The colors are so bright and cheery! Good luck on the lap quilt. Post when it's finished. Wonderful Dawn, looks so good...just love those fabrics..I really have to get myself a Go..
That's very pretty. The white makes it clean crisp and bright. What a lovely quick project. Well done. 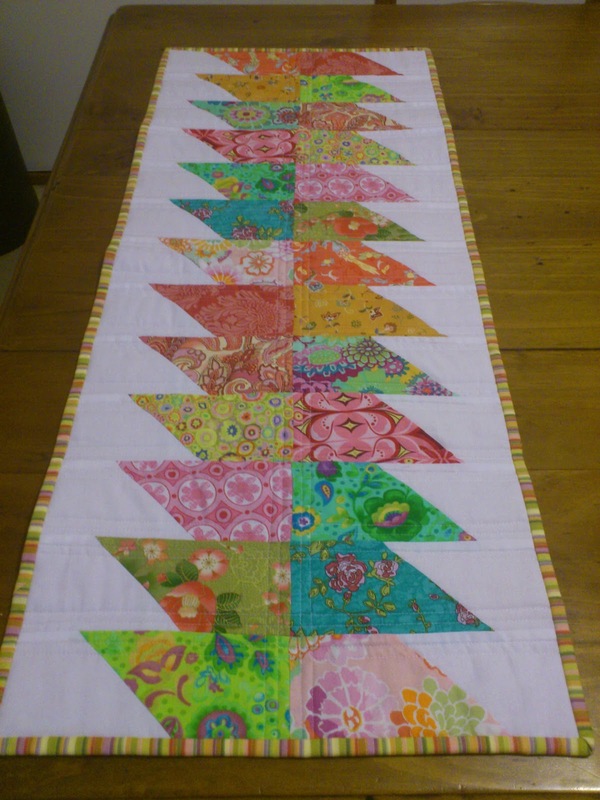 The table runner looks great ! I have a machine too and should make a lot more projects...thanks for the inspiration. Oh sweetie ... that table runner is absolutely Gorgeous!!! And I bet it looks even more divine in person!!! It was definitely worth 'just sewing' this one rather than thinking too hard about positioning of the various fabrics ... and the crispness of the white just helps them pop!!! And thanks for the inspiration ... that is definitely a design I am keen to 'borrow' when my Baby arrives!!! So simple ... yet just so fantastically effective!!! 2 hours???? WOW! It's beautiful, Dawn, and I'm amazed at how quick it was! That looks great with those KF prints - nice job! Looks Great Dawn and Yes I am a Matcher Too...it's Nice to have the Challenge to just Do it! 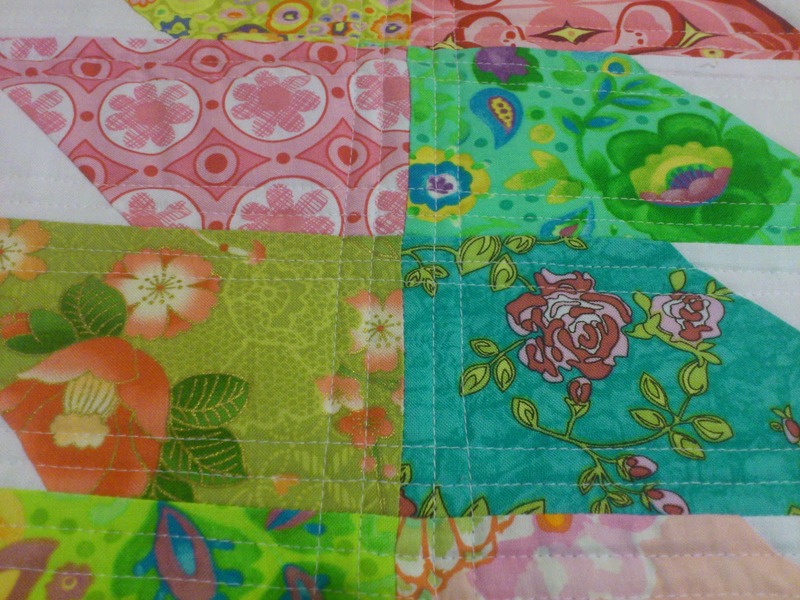 The lap Quilt sounds Lovely. worked out beautifully Dawn.....lurrrrrve that fabric!! !...is there some Kate Spain in there too!!??? Yum! You should be getting commission girl......prompted me to take a look at prices on a Go!!!! Aaaaah....must wait for the taxman! Es maravilloso ver como luce pueste este corredor de mesa. Los colores de las telas muy bien convinados.